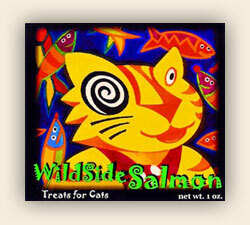 Wildside Salmon freeze dried salmon treats are raw, 100% wild Alaskan Salmon fillet meat. The delicious, tiny, crunchy cubes of salmon are naturally low in ash (4.5% max). So, unlike many other fish products, Wildside Salmon can be given to cats without jeopardizing their urinary tract health. Pure, natural Wildside Salmon is from the Pacific Ocean. The Alaska State salmon fishery was recently awarded the Marine Stewardship Council's "eco-label." The "eco-label" is given only to those industries that have proven to support sustainable resources, healthier oceans and a healthier environment. Dogs love Wildside Salmon treats too!